More Employers Ditching Year-End Bonus | Challenger, Gray & Christmas, Inc.
Higher corporate profits, low unemployment, and high economic confidence among employers is not translating to more cash-based year-end bonuses, according to a survey released Wednesday by global outplacement and executive coaching consultancy Challenger, Gray & Christmas, Inc. In the survey, conducted among approximately 150 human resources executives in October and November, 39 percent indicated that their companies will be awarding a company or individual performance-based, cash bonus this year. That is down from 41 percent who said the same a year ago. Meanwhile, 35 percent said there will be no year-end award of any type, up from 30 percent in 2016. “Slightly more employers are willing to give a non-monetary gift, such as a vacation day or gift basket – 16 percent this year compared to 15 percent last year. It seems, though, that employers are less willing to spread the wealth with their workers despite the positive business environment,” said Andrew Challenger, vice president of Challenger, Gray & Christmas. “These results are surprising, given the tight labor market. Year-end bonuses are a reliable way to attract and retain talent,” said Challenger. The 2017 survey found 10 percent plan to give employees a small monetary award of $100 or less. Meanwhile, fewer employers plan to increase the amount awarded than they did last year. Only 8 percent of employers will increase the bonus amount compared to 18 percent who reported an increase last year. Eighty-percent of employers plan to give the same amount they did in 2016. “Employers reported confidence in the economy, with 87 percent stating the economy was better or the same as last year, so this does not appear to be a “risk aversion” strategy. Employee recognition is becoming increasingly important if companies want to keep their workers,” Challenger said. 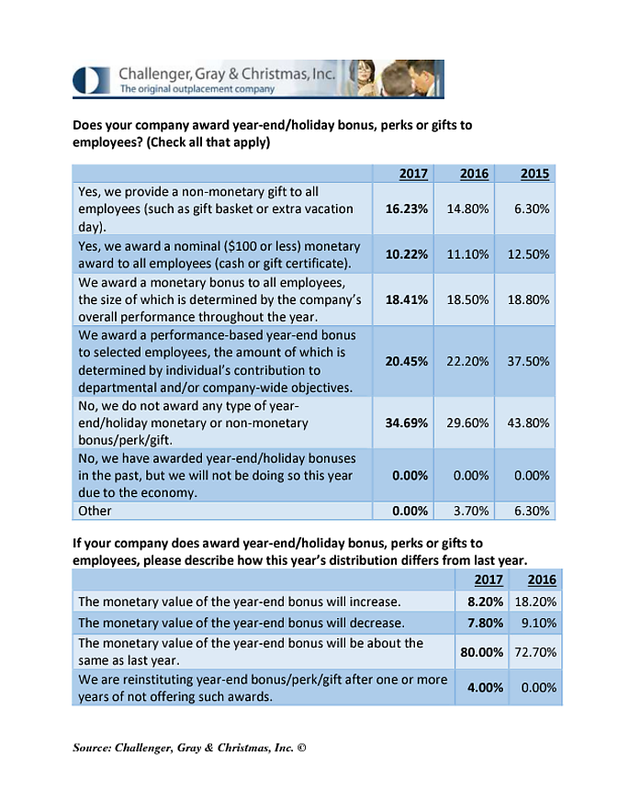 “Even though fewer employers are offering monetary bonuses, most employees still appreciate some sort of year-end gift. Workers want to know that their hard work is recognized and valued. Even a small gift - $50 to a local restaurant or store or an extra paid vacation day – would go a long way,” said Challenger.